Because of the multiplicity of Christian denominations, it is inevitable that their views of the Ten Commandments would be both confusing and contradictory. There is no one specific way for Christians to understand the commandments and, as a consequence, many of the interpretations conflict with each other. Even the lists that Christians use aren't all the same. Most Christians, Protestants, and Catholics treat the Ten Commandments as the foundation of morality. Despite the fact that the text is explicit in holding only the Jews to them as part of their covenant with God, Christians today tend to regard the commandments as binding on all of humanity. For many of them, all of the commandments, even the obviously religious ones, are expected to serve as the basis for civil and moral laws. It is also common for Christians today to teach that the Ten Commandments each have a dual nature: half positive and half negative. The actual text of the commandments is negative in almost every case. For example, prohibitions against killing or adultery. Many Christians believe that there is an implicit positive teaching, something not made explicit and manifest until Jesus came to teach the gospel of love. Contrary to what many might expect, though, none of this remains quite true in the context of evangelical Christianity. Most evangelicals today believe in dispensationalism--a doctrine that teaches that there have been seven dispensations (time periods) through history during which God has made separate covenants with humanity. One of these dispensations was believe to be during the time of Moses and based upon the Law given to Moses by God. This covenant was superseded by the gospel of Jesus Christ that inaugurated a new dispensation which will last until Jesus' second coming. The Ten Commandments may have been the foundation of Gods covenant with the Israelites, but that doesn't mean that they are required of people today. Dispensationalism typically teaches the opposite. While the Ten Commandments may contain principles that are important or helpful to Christians today, people ​aren't expected to obey them as if they are enforced by law. Through this, dispensationalism attempts to take a stand against legalism, or what Christians regard as an inappropriate fixation upon laws and codes at the expense of love and grace. This de-emphasis of laws like the Ten Commandments is shared by Pentecostal and Charismatic groups, but for a different reason. Rather than focusing upon dispensational teachings, such groups focus upon the continued guidance of Christians today by the Holy Spirit. Because of this, Christians are not in as much need of commandments in order to follow the will of God. In fact, adherence to the will of God might lead a person to act contrary to earlier commandments. All of this is rather curious in light of the fact that the Christians most likely to insist on government displays of the Ten Commandments are most likely to be evangelical or Pentecostal. Were they to adhere more faithfully to their own traditions, they would likely be among the last to support such actions and might, in fact, be among the most vocal opponents. What we see instead are that the Christian denominations where the Ten Commandments have traditionally retained a more important religious role. Catholic, Anglican, and Lutheran are the least likely to strongly support government monuments and the most likely to register objections. 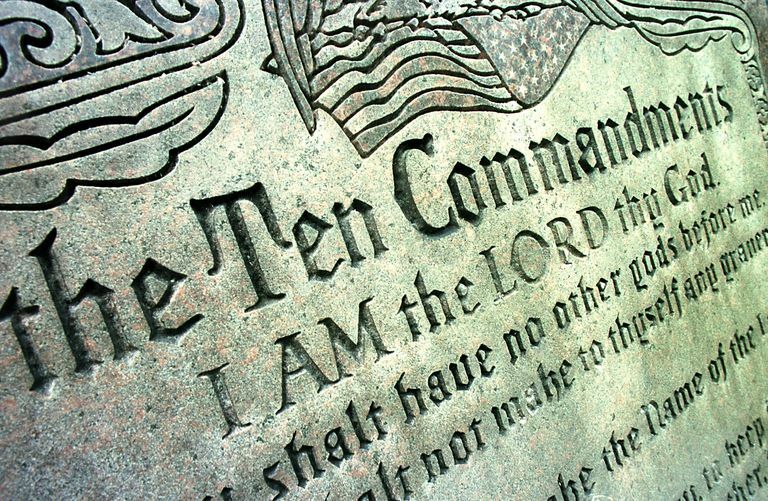 How it is that dispensationalist Christians who consider the Ten Commandments a facet of an earlier, non-binding covenant can also insist that they are the foundation of American law and must be promoted, remains a mystery. Should Christmas Be a Secular Holiday?